This week, conservation went global – in a very literal sense. Our task: to package and transport sections of a wooden globe, no mean feat considering the globe in question was nearly 1.5 metres in width. This globe is one of two made by Jacques Elisée Reclus, a French geographer, both of which are held in the Patrick Geddes collection. In 1895, with the support of Alfred Russel Wallace and Patrick Geddes, Reclus proposed the construction of a huge relief globe approximately 420 feet in diameter, but this was never realised. Geddes’ proposed Institute of Geography in Edinburgh was to incorporate the Reclus globe within it. 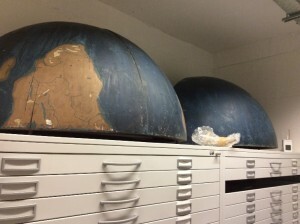 We think the two globes we have here, which came from the Outlook Tower and were made for Geddes by Reclus, may have been models made for that project. 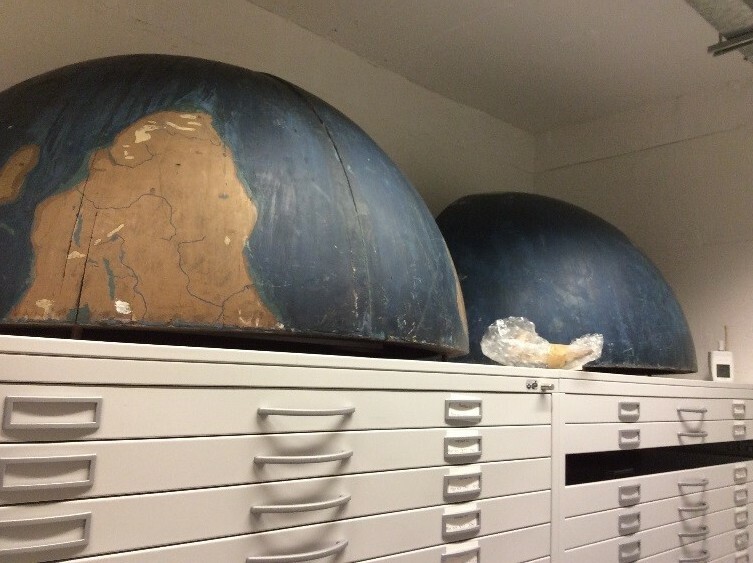 These globes, now in sections, were required to be packed for storage and transported to a new location (luckily for us, still in the same building!). For this purpose, it is important to choose appropriate housing methods and materials as this will act as a good preventive measure, helping to ensure the long-term preservation of the object. As well providing physical support for items, suitable storage will have the added benefits of providing an extra layer of protection from accidental damage during handling and transportation. It will also act as a buffer to atmospheric pollutants, dust, and light, and guard against any fluctuations in environmental conditions. Appropriate packaging will also come into its own if there was ever to be a flood or water ingress, acting as a barrier and thus protecting the contents from more serious damage. Due to its weight and size, boxing the first globe was not an option. It was decided therefore to soft-wrap its individual sections, using acid-free tissue paper and bubble-wrap. 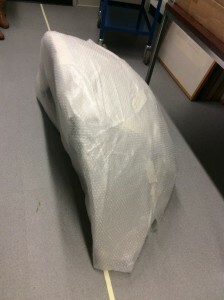 Bubble-wrap was used to provide protective cushioning to the item but it is important that it is used correctly (yes, there is a right and wrong way to use bubble-wrap!). In most cases, it is recommended that the ‘bubbles’ face away from the object – this reduces the risk of creating indentations or marks up the item, particularly if the surface or media is vulnerable, friable or has surface dirt. 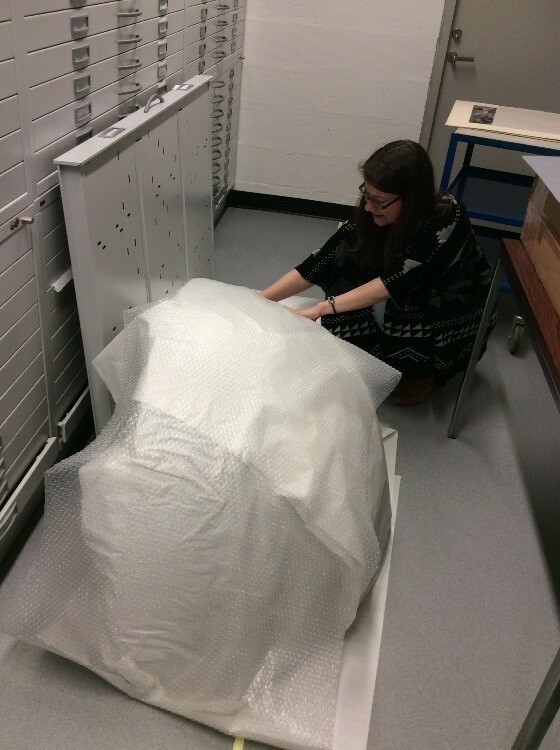 It is not recommended, however, for bubble-wrap to be placed in direct contact with an object as it is not a recognised conservation-grade material. Acid-free tissue was therefore used as an interleaving layer between the surface of the globe sections and the bubble-wrap. As the name suggests, it is acid-free and thus a material that we use often, whether for interleaving, wrapping and cushioning objects or padding out excess space in the form of tissue ‘puffs’ or ‘sausages’. Once safely packaged, we were able to move the globe sections into one of our environmental controlled stores. This will ensure that the temperature and relative humidity conditions are kept stable, and protect against any global warming…. 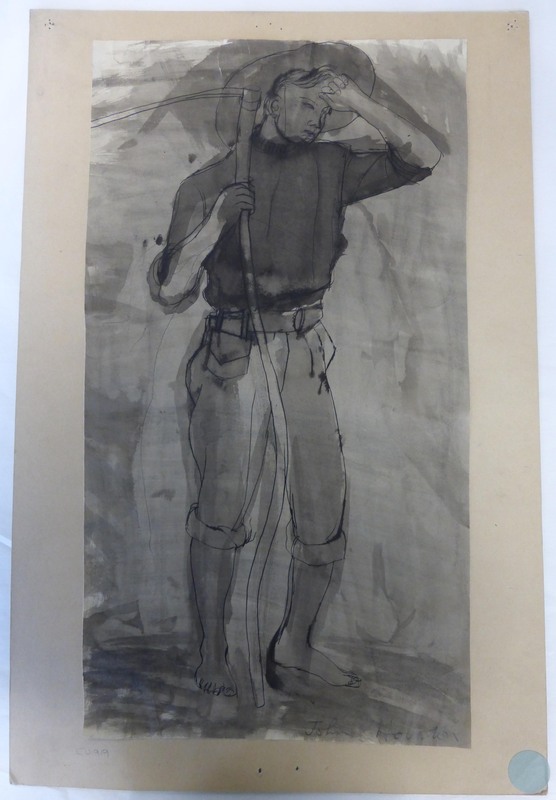 At the start of April, I started conservation work on the Edinburgh University Art Collections. I had previously been working at the Lothian Health Services Archive on a 12-month project to conserve their HIV/AIDS collections. When this came to an end, I was delighted to be offered the chance to work on a new collection at the University. I started off by unframing a selection of works of art on paper. These items has been previously framed using low quality mountboard. This can be damaging to the artwork as this board can become acidic over time, which can migrate to the artwork and cause staining. 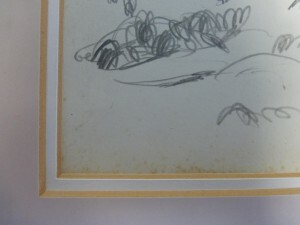 Unframing artworks is great fun as you never know what you will find underneath. Sometimes, you can find interesting inscriptions or hidden sketches, however, often you find more conservation problems! 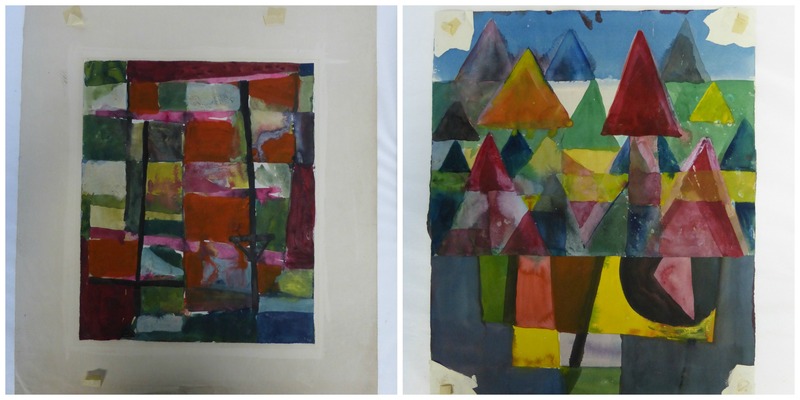 In this collection, I found that many artworks had been adhered into frames using pressure sensitive tapes, such as masking tape and sticky tape. 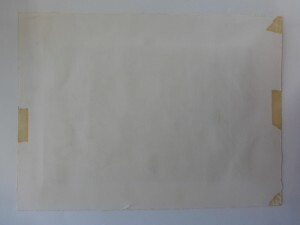 Tapes such as this can become stuck on to the paper and be very difficult to remove. To remove these tapes, I used the gentle application of heat which softens the adhesive and makes it easier to peel off using tweezers and a spatula. As these tapes age, it becomes even harder to get them off and the adhesive can soak into the paper causing staining. To remove these aged tapes, solvents can be applied using a poultice. However this can be time consuming, and has health and safety issues due to the exposure to solvents. Another problem I encountered was that some artworks were adhered overall to a piece of mountboard. This can be problematic if the mountboard is acidic as this acid can migrate to the paper and cause weakening and discolouration of the sheet. Also, if the artwork is stored in high or low humidity, the mountboard and paper will react differently to moisture, and potentially cause cockling (paper conservation term for rippling of the sheet) and tearing. Boards such as this can be removed in small pieces by using a scalpel with a number 22 blade. 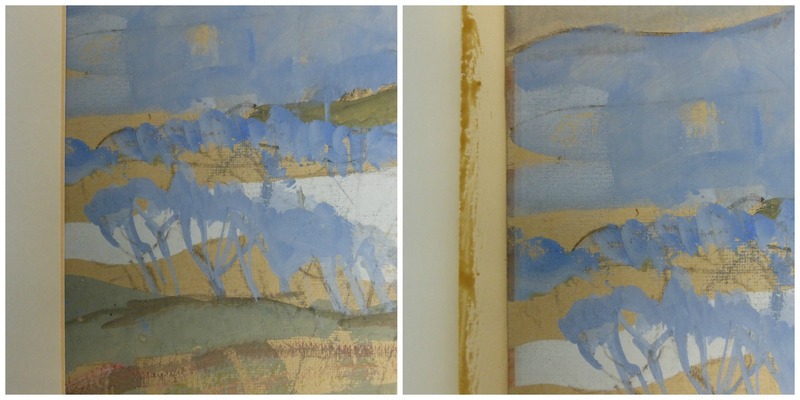 The layers closest to the artwork can then be removed using a poultice such as the one described in Samantha Cawson’s blog. When an artwork is unframed, it can give you clues to it’s original condition. For example, when I unframed this artwork by Anne Redpath, I found that there was a clear difference between the areas that could be seen and the areas underneath the window mount. The paint that was white in the exposed area, is pink in the hidden areas; the blue in the visible area is red underneath the mount! The difference in colours could be caused by the effect of light on the exposed areas of the artwork, which has caused the pigment to fade. 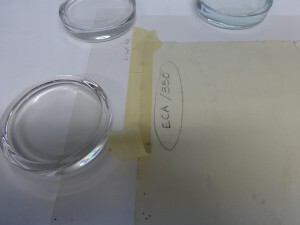 Equally, the pigments may have changed colour due to contact with an acidic window mount. More research is needed to find out the exact cause. As you can see this discolouration has completely changed the look of this painting and it is hard to imagine how it could of looked originally. Sometimes during unframing you can also discover things that are completely new. 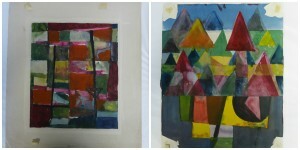 For example, after I had unframed this watercolour by Alan Davie, I found another watercolour painted on the other side! This watercolour has been protected from the light, and so the colours have remained very bright and vibrant. Here is another sketch I found underneath a mount. The card mount had been adhered to the back of the artwork with multiple dots of glue. I removed the card mount using a scalpel which revealed another sketch of a similar model on the recto, and then removed the adhesive residue using a CMC poultice. 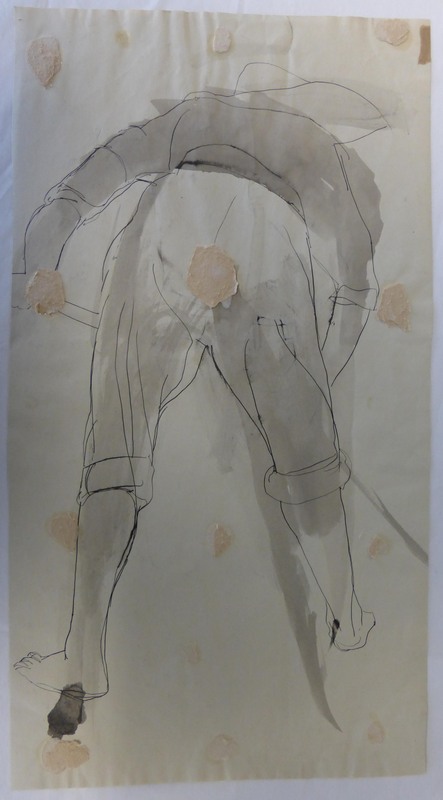 This reuse of the sheet is common among artists as a way of making the most of expensive art materials! Good framing is essential to the longevity of an artwork. When framing works of art on paper, always use good quality inert materials, such as 100% cotton rag mountboard, and use reversible adhesives such as wheat starch paste. Never adhere artworks directly to a secondary support, instead use hinges made from Japanese paper. And please do us paper conservators a favour, never use pressure sensitive tapes on paper artworks! Our conservation volunteers have been doing a fantastic job over the past months surface cleaning, repairing and re-housing the Library Correspondence from the University’s archive collection. 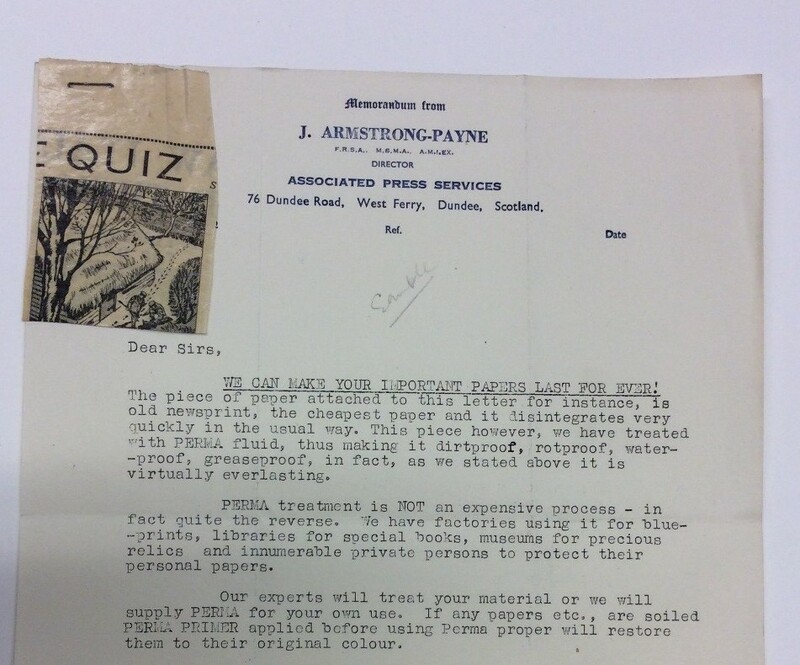 There have been many interesting pieces uncovered during this work, but one such item in particular caught our eye, namely an advertisement for conservation services – 1940s style! This advert for ‘PERMA’ treatment and its claims that it can make your important papers last forever with its “dirtproof, rotproof, waterproof, greaseproof” qualities just goes to demonstrate how far conservation has developed from the 1940s to the present day. 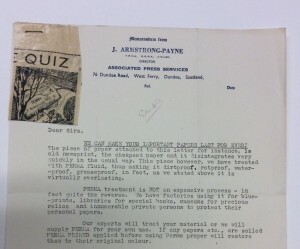 Although the attached treated sample piece does certainly appear to have lasted the years (although whether it is “everlasting” awaits to be seen…) it is not a treatment method that we would employ today. Ethical considerations and guidelines, are much more ingrained in the modern-day conservation profession with the physical, historical and aesthetic integrity of the object now being placed at the forefront of our decision making. Alongside the development of the conservation profession, comes a greater understanding of the methods and materials that we use, allowing us to make much more informed decisions regarding appropriate treatment options. Two of the main principles that we work towards are the concepts of minimal interventive treatment and reversibility (ideas that are not particularly compatible with ‘PERMA’ treatment). This ensures that the risk of introducing anything which may adversely affect the object is kept to a minimum, whilst allowing for the chance that new, improved, techniques and materials may be developed in the future. However sound these principles may be, it can only go so far, for example, surface cleaning – although important – would not be necessarily be considered reversible and therefore must be taken into account when deciding on a treatment plan.